One of the most promising fish for future aquaculture. This fish has many qualities to give it all-round appeal as aquaculture species for the future. It has been argued that this species has the best eating quality of all Australian freshwater fish. Extremely easy to transport at high densities. Can be kept and grown in high densities. Early indications are that it will be unsuitable for pond grow-out situations, however it is ideal for growing in recirculating systems. There are a few smaller growers who have already tried these fish for themselves with positive result. These growers have not had the benefit of having a blue print to follow. 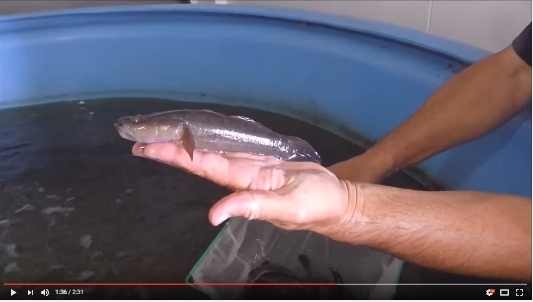 In Asia there already exists a fish very similar to our Sleepy Cod. It is known as the marbled or sand goby (Oxyeleotris marmoratus). Asian sleepy cod are grown throughout South East Asia, particularly in Malaysia, Thailand and Vietnam. They are the highest priced freshwater fish in Asia, with farm gate prices of over AU$30 in Taiwan. Retail prices in Malaysia and Thailand are around AU$45 per kg. This fish fetches some of the highest prices, (around four times that of Silver perch) and is regarded as top quality. There is no doubt an overseas market is out there just waiting for someone to meet. Shipping live, market sized Sleepy Cod, should prove to be relatively unchallenging. They do seem to live up to their name, “sleepy” and lay motionless in shipping bags. This means their use of oxygen is minimal and therefore production of CO2 low. Many large fish should be able to be packed in an absolute minimum amount of water. Experienced hatcheries have no difficulty producing fingerlings, however they are one of the more time consuming species to produce, with a low larval to fingerling survival rate, and therefore are an expensive fingerling. If you intend to purchase fingerlings they should be ordered well before the season begins to avoid disappointment. The picture at the top of the page is of a wild caught orange fish. This orange form is extremely rare in nature. Research conducted by the Walkamin Research Facility in Far North Queensland has so far not been able to reproduce this colour in commercial quantities. All off spring are brown until they reach approximately 120-150 mm. About 5% of offspring have orange blotches, mostly about the head. Only 2-3% attains full colour. This research has been suspended for the time being. * The Dawson River flows into the Fitzroy River. The Fitzroy River flows into the sea at Rockhampton. This population is well south of the nearest northern populations. The Fitzroy/Dawson River strain, grow better than northern strain for aquaculture. Recirculating systems necessary for grow-out. High fat diets, (15-20%) undesirable as the fat damages the liver, this will affect FCR because the liver is an important part of the digestive system. Placid and easy to handle. Fitzroy/Dawson strain genetically distinct from northern strain. The Murray cod industry is generally working in the 50-150 kg/m3 range (ie min-max density). We believe this is a good guide that should be followed for sleepy cod. It must be stressed, that many of the good operators, (Murray cod growers) are using oxygen generators to increase DO saturation to above 100%, this, along with high densities, is part of the recipe to successful growing of cod in general. They are very temperature tolerant. We have recorded temperatures in our ponds with brood fish, and small fingerlings, as low as 9c and as high as 35c. (We do not recommend handling them at low temperatures.) At Ausyfish we routinely have broodstock in ponds during winter at temperatures as low as 14C and sometimes as low as 11C. During these cold times we are not able to handle these fish and do sometimes experience some minor losses. At temperatures above 14C we do not experience any difficulties. We only stock Fitzroy/Dawson strain. They are very hardy and handle well, but do not handle well if temperatures are below 18c. Transport is easy as they live up to their name, "sleepy cod," and sit motionless in shipping containers. This results in low oxygen demand, and low ammonia production. Packing densities are still to be researched, but they should be very economical to ship live, packed densely, with a minimum amount of water. Fingerlings are easily weaned. Our fingerlings are not weaned as we believe it is better to ship the fingerlings soon after harvesting when they are in peak condition. They are raised in plankton ponds where they feed on natural food. We also believe that when weaned, then shipped, the stress results in a loss of confidence by the fingerlings in eating artificial food. They then need to be re-trained on to artificial food. The natural diet of sleepy cod is carnivorous. They feed on fish, freshwater shrimp and freshwater crayfish. They will therefore do best on a high protein diet similar to barramundi. The colour of sleepy cod can change according to environmental conditions. No research has been conducted to determine how to manipulate their colour but it will be possible to provide fish to the market in a preferred colour once some trials have been carried out. Temperature and light will most probably be the factors that effect the fishes colour. They are capable of changing colour within a few minutes. Below are some examples of their ability to display a range of colours. These fish were all taken from the same pond at the same time. The sleepy cod is not suitable for free-range pond culture as they are highly carnivorous and cannibalistic, as well as very territorial. They are able to eat other sleepy cod fingerlings up to half their size. It is necessary to grade fingerlings regularly. It is also possible for the fish to stop feeding on the artificial diet if they are in an open environment. Ausyfish can supply fingerlings from about January produced from the Fitzroy/Dawson strain. Fingerlings are a minimum of 4cm and can be shipped to most major cities world wide.